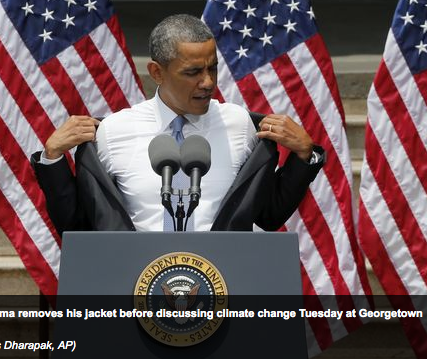 …Obama’s speech on CO2: trying to be politically scientifically environmentally friendly…! • Renewables are a major part of the solution today. No, they are almost trivial. Today, the world gets 81% of its energy from fossil fuels – by 2035, in the most green scenario, we will still get 79% from fossil fuels. Wind and solar will increase from 0.8% to 3.2% — impressive, but not what is going to matter. • Biofuels should play a major part of the solution. No. For now, biofuels simply diverts food into cars, driving up food prices and starvation, while clearing forests for new fields emit more CO2 than biofuels save. • Efficiency can cut emissions. No. While efficiency is good, studies show it has little climate impact, because its savings gets eaten up by more use. As your car gets more efficient, you drive it further, and the money you still save get used for other carbon-emitting activities. …Obama did express the dangers for the future of our children and children’s children, and future generations…! …i think that by 2035 it will be clear where this World is heading for…! I WISH AND HOPE TO BE THERE to be a witness of clearly declared prophecies and my countdown or countup started since 2013…! ← …Enbridge Oil pipeline in trouble again…!